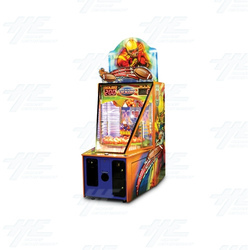 Goal Line Rush Ticket Redemption Machine is an exciting new game from Namco. In Goal Line Rush players gaze over dozens of "mini" style footballs on the rotating circular playfield, all labeled with different ticket prize values. In the middle of the platform is a football player that moves back and froth during gameplay. The player pushes a button to make the football player rush forward, in a attempt to push as many of the mini footballs off the playfield and into the "endzone" touchdown area, where players receive the cumulative values of all the mini-footballs pushed into the end zone. You might get a touchdown if you aim for the right ball. Try to get the Jackpot! The mini-footballs are equipped with special sensors that allow Goal Line to determine all the points accumulated by the player and the proper ticket payout amount.Furthermore, the ball moves in unique ways which makes it extremely fun for both children and adults! Goal Line Rush Ticket Redemption Machine is an exciting new game from Namco. In Goal Line Rush players gaze over dozens of "mini" style footballs on the rotating circular playfield, all labeled with different ticket prize values. In the middle of the platform is a football player that moves back and froth during gameplay. The player pushes a button to make the football player rush forward, in a attempt to push as many of the mini footballs off the playfield and into the "endzone" touchdown area, where players receive the cumulative values of all the mini-footballs pushed into the end zone. You might get a touchdown if you aim for the right ball. Try to get the Jackpot! The mini-footballs are equipped with special sensors that allow Goal Line to determine all the points accumulated by the player and the proper ticket payout amount.Furthermore, the ball moves in unique ways which makes it extremely fun for both children and adults!